This paper examines prospects for compromise between competing perspectives on four key climate change issues: costs, level of domestic action, environmental integrity, and developing world involvement. It focuses on the policy issues stemming from uncertainty about abatement costs. Based on extensive simulations of a model integration tool, SAP12 (Stochastic Assessment of Climate Policies, 12 models), the analysis considers options for fine-tuning the Kyoto Protocol, such as concrete ceilings or levies on carbon imports; "environmental restoration payments" to be made on excess emissions; and credits for sequestration activities in Annex B countries. It demonstrates that a restoration payment (implemented through a safety valve) emerges as a superior means of addressing the cost uncertainty issue. The paper concludes that had this approach been taken at the COP6 climate negotiations in The Hague, there would have been substantial room for compromise on payments of $35 to $100 per ton of carbon. Examining the Marrakesh (COP7) climate accord, it derives some lessons for attempts at completing Kyoto's unfinished business or at moving on to a new framework. Oil Price Shocks and the U.S. Economy: Where Does the Asymmetry Originate? Rising oil prices appear to retard aggregate U.S. economic activity by more than falling oil prices stimulate it. Past research suggests adjustment costs, financial stress, and/or monetary policy may be possible explanations for the asymmetric response. This paper uses a near vector autoregressive model of the U.S. economy to examine where the asymmetry might originate. The analysis uses counterfactual experiments to determine that monetary policy alone cannot account for the asymmetry. 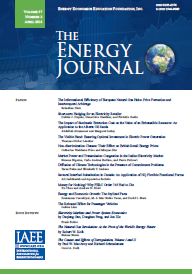 The Capital-Energy Controversy: An Artifact of Cost Shares? Any serious empirical study of factor substitutability has to allow the data to display complementarity as well as substitutability. The standard approach reflecting this idea is a translog specification-this is also the approach used by the majority of studies analyzing the substitutability of energy and capital. Yet, the substitutability between capital and energy and the source of discrepancies in the results still remain controversial. This paper offers a straightforward explanation for at least the divergent results provided by the translog studies: Using a translog approach reduces the issue of factor substitutability to a question of cost shares. Our review of translog studies demonstrates that this argument is empirically far more relevant than the distinction between time-series and panel studies being favored in the literature. More generally, we provide ample empirical evidence for our argument that the magnitudes of cross price elasticity estimates of two factors gleaned from static approaches like the translog functional form are mainly driven by the cost shares of these factors. The Mexican energy regulatory commission--Comision Reguladora de Energia (CRE)--has implemented a netback rule for linking the Mexican market for natural gas with the North American market. This paper describes the economic analysis that supported this policy. We show that the netback rule is the efficient way to price natural gas and it is in fact an application of the Little-Mirrlees Rule. This paper studies Cournot competition with two generators who share one transmission line with a limited capacityto supply price-taking consumers. In such a game the network operator needs a rule to allocate transmission capacity. Three rules are studied: all-or-nothing, proportional, and efficient rationing. The first result is that if the network operator taxes the whole congestion rent, the generators strategically change their production quantities, such that the network operator obtains no congestion rent. This gives poor incentives for investment in transmission capacity. The second result is that the network operator can create competition among the generators, which can increase welfare. Marginal nodal congestion pricing, which is optimal under perfect competition, is sub-optimal when generators can set their production quantities freely. It does not generate revenue for the network operator, nor does it increase competition among the generators.